Taken loads of holiday photos you have no idea what to do with? A presentation would take way too long, or you can't get all your family around at the same time? 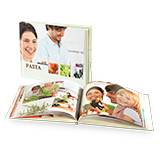 Present your photos in an elegant way in a Pixum Photo Book. You'll see - creating your own holiday Photo Book is both more impressive and more entertaining than any slide show! Select a Photo Book with a hard cover for that classic holiday album feel. The ideal way of showing off your holiday photos! Write short reports of what you got up to to go with each of the photos, or even just the name of the place and when you where there. For a short trip, such as a weekend city break, make a Photo Book with 26 pages. But maybe you want to document a world tour or your fly-drive visit to the States? With the Pixum Photo Book software you can add pages to your Photo Book, up to a total of 154 pages, crammed full of your best holiday photos. Download and install the free Pixum Photo Book software to preserve the memories of your latest trip. That way, you'll have a whole range of options for creating your Pixum Photo Book.